I don’t think I know anyone who really gets excited about leftovers. When I was a kid, we always had the leftovers buffet for Sunday lunch. My mom didn’t have to work to prepare a nice meal, and we weren’t wasteful because we set aside an opportunity to use the leftovers. My mom always ate what needed to be eaten up. Maybe it was the oldest, or maybe there was just a little dab left. She didn’t want to let those remnants go to waste. Now that I’m the mom of the house, I find myself eating up all the little bits of this and that which are left over, creating some very interesting meal combinations. But, I don’t want to be wasteful, so I do it. John 6 records a story of “leftovers.” Here Jesus miraculously feeds over 5,000 people from five small loaves of bread and two fish. It didn’t look like much, but Jesus thanked his Father for it, and began to work a miracle. What if we could just give thanks for the small portion we have been given — whatever it is — and trust God to do a miracle with it? The story tells us that everyone ate “as much as he wanted.” That’s just awesome. Guys, Jesus has enough. Whatever we stand in need of, he’s got enough. No matter how few fish we have in our basket to offer him, he’s got the power and the compassion to use it. It will be enough. Some days I feel horribly inadequate. But if I take the small amount of ability that I have and give it to Jesus, he will do more with it than I could imagine. Jesus isn’t going to run short on whatever I may need. From our talents and abilities, to our weaknesses, to our physical abilities or inabilities, to our resources or lack thereof — Jesus can use it if we give it to him. And miraculously, I believe, we will find, it is enough. Because he is enough. Let nothing be wasted. I love those words. Especially as I ponder God’s choice of apraxia for my daughter, for our family, those words bring me such peace. There is no part of my difficult journey, of Sophie’s difficult journey, that Jesus will not use to make me a better version of myself and to bring more glory to his name. Jesus wastes nothing. What he has chosen for her life, he will never waste on her behalf. I’m looking for basketfulls of his amazing glory in her life story. 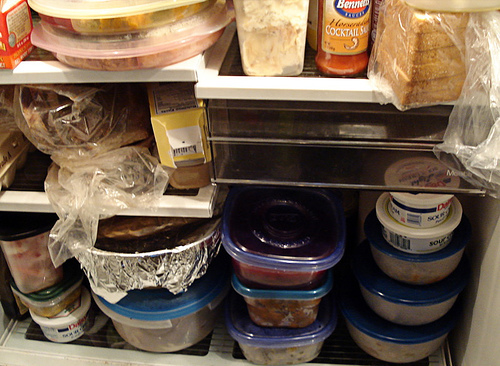 There’s also another way to look at this story of leftovers. Perhaps trodden upon, mashed, mangled from life’s hardships, sometimes we ourselves don’t feel like much but a leftover. But Jesus says, “let nothing be wasted.” My heart hears: “let no one be wasted.” No matter how mangled, torn, or used up we may feel physically, spiritually, or emotionally, in Jesus’ eyes, we are not beyond use. We are worth gathering up. We are still useful, usable, in his eyes. As a child without words, Sophie is often overlooked by others. Few people, especially peers, truly understand how to interact with her. Yet I know that my Jesus sees her. To Jesus, she is not a leftover, to be passed over because she can’t enter in the same way as others. No one is beyond his use, no matter the disability, the dysfunction, the damage. The leftovers aren’t a chore to Jesus like they sometimes can be to me as I eat a strange concoction of fried cabbage, noodles and olives, and half a sloppy joe. Jesus won’t waste our experiences and he certainly won’t waste us.